Wedding days can get pretty hectic and the last thing you will want to be doing is worrying about misplaced gifts and cards. These post boxes will look great on a table and as well as having a top slot for your cards these are large enough for small gifts too! The top can be easily lifted off and you will know exactly where everything is! The pictures below are just some of the boxes that we have designed to couples requests, these will give you an idea of the dimensions of the box. All boxes can be personalised with any wording you wish, or you can simply have the wording that is shown in the pictures below. Posted flat with everything attached - measures 25cm x 25cm x 50cm when reassembled. 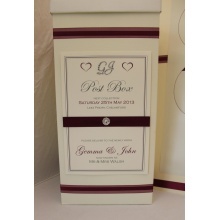 All are personalised with ribbon and font colours to match your colour scheme and the boxes come in off white or ivory. All you need to do is let me know your colour scheme and I will design your plaque and email you a proof also confirming what ribbon choices you would like. All boxes are priced £22.99 including all ribbons crystals and sign. Your box can be shipped to you for £6.99 or if you live locally can be collected from our office in Sedgefield.